I don't know how he does it. All of Riordan's characters are sarcastic, yet each one has a distinct voice. In his latest, the main character, Magnus starts out with an acerbic, bitter sense of humor that I initially found off-putting until I found myself laughing out loud. Magnus is a homeless dude, who never knew his father and whose mother died two years ago from two wolves attacking them in their apartment. He knows all about watching his back. But what he doesn't know is that the Gods are real. Having explored Greek, Roman, and Egyptian mythology, Riordan now turns to Norse mythology. I am not familiar with any of these mythologies and there are probably nuances I would appreciate more if I were. But Riordan's fresh turns and twists make any familiarity unnecessary to thoroughly enjoy his tales. His writing is also very formulaic. There's always a quest with about a week deadline. If the band of heroes doesn't accomplish something for the Gods, the end of the world will come. Yet, Riordan manages to keep his writing fresh despite the formula. In this iteration, Magnus and his friends have to rebind Fenris Wolf or he will bring about Ragnarok, the Day of Doom. One of the ways Riordan kept the story fresh this time is that Magnus actually dies. This isn't a spoiler: it happens at the very beginning of the novel. Another way is that Magnus is not a traditional hero. While other demigods spend their time killing monsters, Magnus lets his sword do the dirty work for him. Or he finds alternatives to fighting. 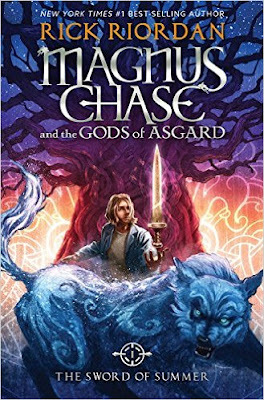 Although I have enjoyed the complexity of multiple viewpoints in some of Riordan's recent books, it was refreshing to stay with one character this time. One of the ways that this manifested is that Riordan had a lot of fun with chapter titles. (In previous books, the titles were the names of whomever the viewpoint was from.) Some examples: "Phil the Potato Meets His Doom" and "Oh... So That's Who Fenris Smelled in Chapter Sixty-Three." If you've enjoyed other books of Riordan's, you certainly will enjoy this one too.